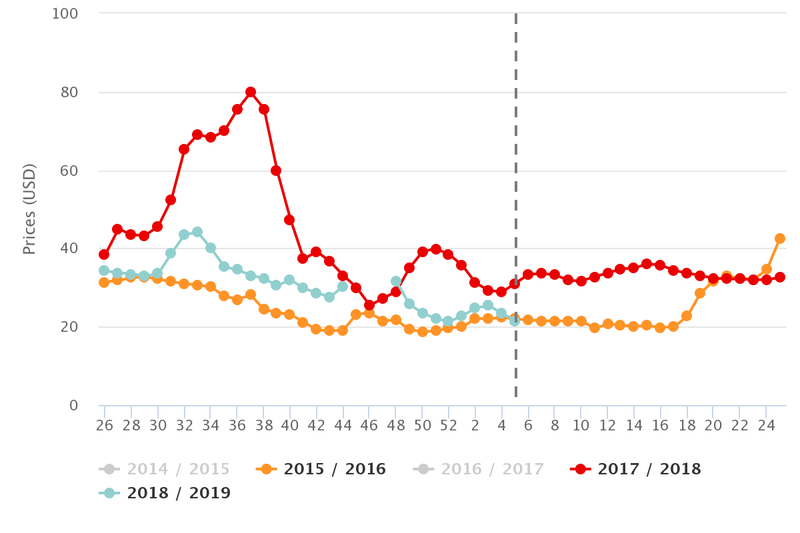 Avocados in Charts: Record volumes for Super Bowl sent prices down – will this trend continue? Avocado prices have continued to drop in the U.S. market after Mexico sent record volumes to satisfy the demand for the Super Bowl. This has alarmed some in the industry, many of whom still a bit shaky after the most recent strike which only ended three months ago. The rollercoaster ride of shipments over those three months has set records, with the highest volumes-ever sent to the U.S. in the three weeks leading up to the Big Game at the start of February. 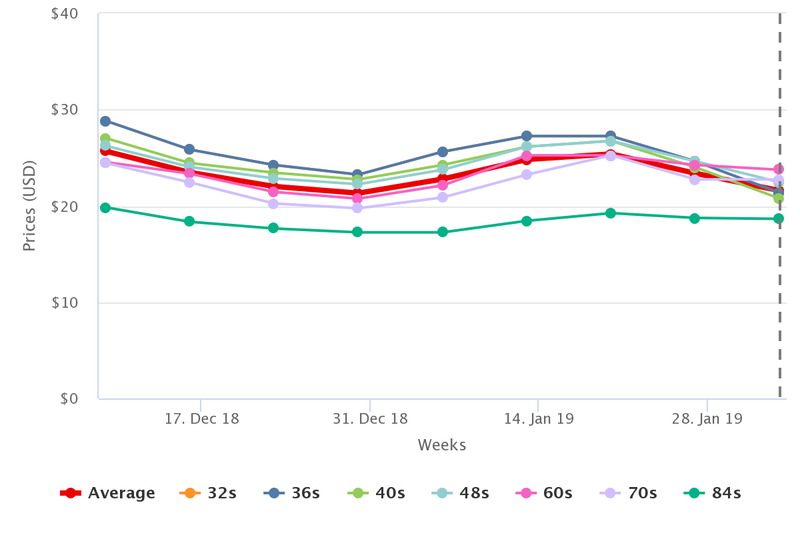 However, the total volume sent from week 26 to week 5 are only 94% of the amount shipped over the same period in 2015/16, the current record holder for that timeframe. Considering that the season is not over and there is still fruit to be picked, I took a look at what happened three years ago to get an idea of what we might be headed into. The similarities between 2015/16 and this season are reflected in prices as well as volumes. 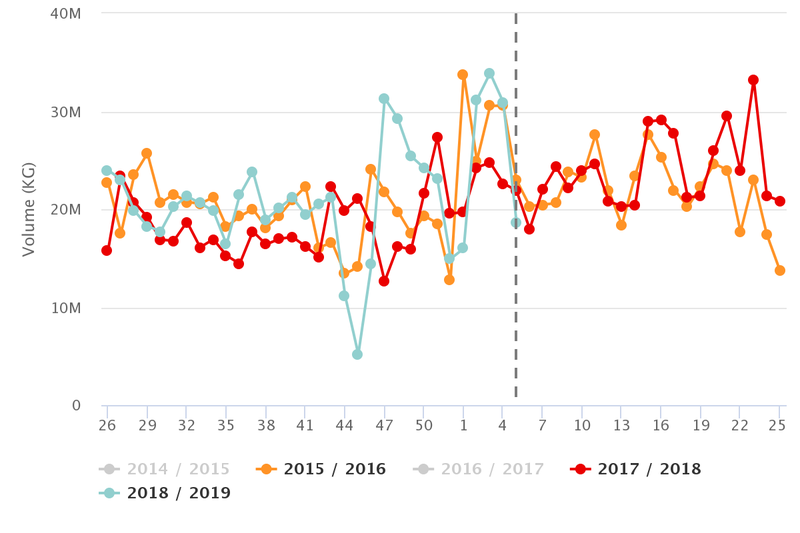 The chart below compares the last two years against 2015/16, with interesting results. As the volumes have been increasing - notably after the strike in weeks 45-47 - the prices have been coming down. In week 5, they even dropped below the same week's price from three years ago for the first time. The concern is that the industry is used to considerably higher pricing, which is creating friction and strikes. Notably, in 2015/16 there was also a strike due to frustration over pricing. Unfortunately for the best aspirations of producers and shippers, the markets aren’t generous enough to take massive volumes and offer exorbitant prices at the same time. In order to get consumers to purchase more avocados retailers must drop prices or keep prices high and throw away unsold fruit. So if low prices are causing problems, it is a problem created only by the great job Mexico's producers have been doing in growing the fruit. What the chart below tells us is that while Mexico's season dominates, it is very likely that prices will stay low in order to absorb their bountiful harvest. The silver lining to all this is that with similar volumes prices have been steadily above what we saw three years ago. This means that demand is still increasing and there is more room for avocados than there was before. 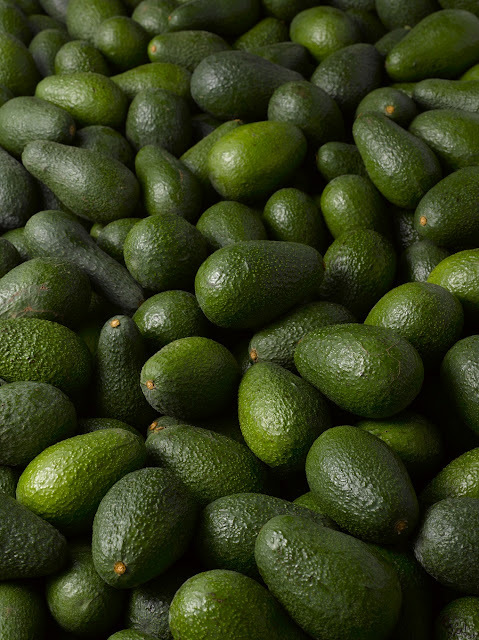 To avoid, or somewhat mitigate the effects of overproduction, I would suggest to the Mexican government and producer groups to continue and expand their push to open Mexican avocados to as many markets as possible, giving producers the more options at the moment of commercializing. If prices and returns can be improved, shipping containers anywhere else in the world will only increase prices and stabilize the traditional markets already dominated by the country. 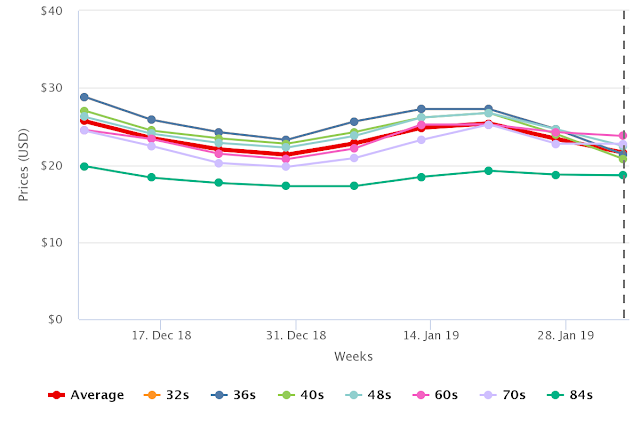 As a useful tool for readers to gauge how the markets are currently evolving, we offer below weekly pricing by fruit size.